Fire compatible Speedlite flashguns over distances of up to 30m. Radio-frequency control provides reliable operation even when direct line of sight is not possible. A radio-frequency flash trigger aimed at professional photographers using off-camera flash. 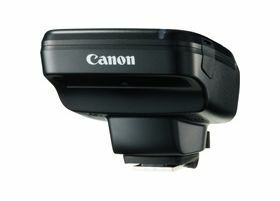 Control compatible Canon Speedlite flashguns over distances up to 30m. 2.4GHz radio frequency triggering operates reliably, even when shooting outdoors and around corners – direct line of sight not required. Create intricate multi-flash lighting set ups, triggering up to 15 Speedlite flashes with a single camera-mounted Speedlite Transmitter ST-E3-RT. E-TTL II flash metering makes exposure control easy. Trigger an EOS camera fitted with a Speedlite Transmitter ST-E3-RT from a second unit or from a compatible Speedlite flashgun, such as the Speedlite 600EX-RT. Up to 15 cameras can be triggered at once, for synchronised shooting. The Speedlite Transmitter ST-E3-RT is sealed against dust and moisture to the same degree as professional EOS cameras and L-series lenses. It features an easy to read back-lit LCD control screen and is powered by two AA/LR6 batteries.